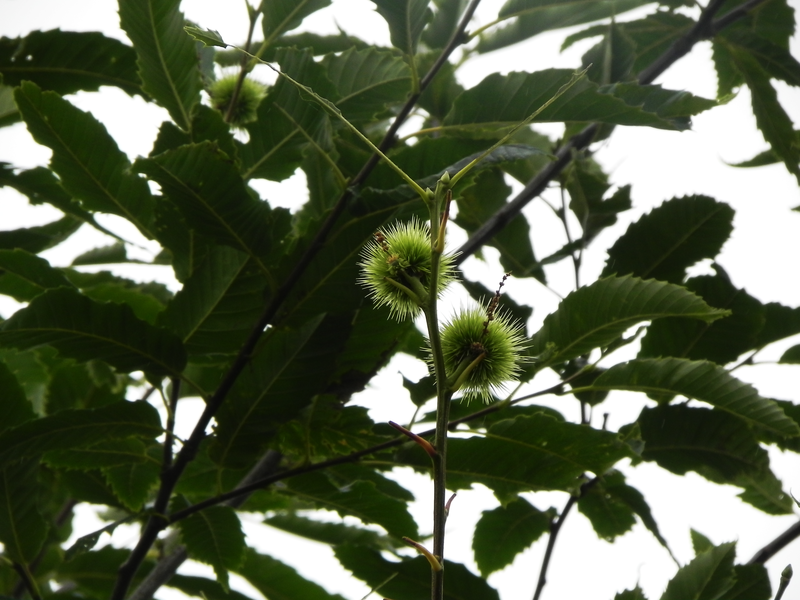 A couple of weeks ago, when we were talking to the guy who planted the Horse Chestnut trees, he mentioned that he had also planted a Sweet Chestnut tree – just over there. Naturally we started to look ‘just over there’ to see if we could pinpoint a tree that looked as though it had been planted – rather than it had just volunteered. It didn’t take us long to spot a sprightly young specimen who still had the tatters of one of those plastic tubes young trees are planted in, hanging round his knees. As he is now fifteen to twenty feet high, it is fairly safe to say that he has outgrown the need for its protection. We blame this one on the Romans. The nuts are ground into flour and cooked into a porridge – the cooking kills the bitter taste – then the porridge is fed to legionaries just before they go into battle, so they brought them with them when they moved in here – just in case. Sweet Chestnut wood is very strong and has excellent water resistant qualities so is made into barrels for Balsamic Vinegar which (well, the real stuff, anyway) has to be stored for twelve, eighteen or twenty five years so needs a decent cask. Dr Edward Bach said that an essence prepared from Sweet Chestnut flowers was needed by people who could see no way out and were at the end of their resources. Oh, and the leaves are good for whooping cough.